Last year's Owl and the Japanese Circus was a solid read, an entertaining urban fantasy that managed to reignite my excitement for a genre that I felt had become tiresome and repetitive. Granted, the whole “Indiana Jane” aspect was a big part of that - I'm a sucker for any sort of archaeological, tomb-raiding adventure - but Kristi Charish really impressed me. 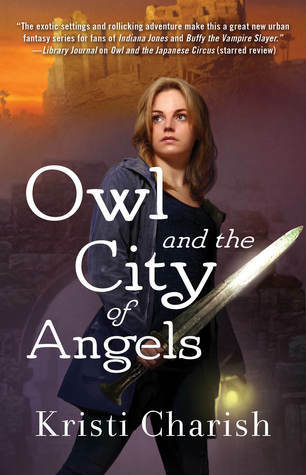 I went into Owl and the City of Angels hoping for more of the same, but not really knowing where she'd take the story next. The simple answer to that? To a whole other level. This is one of those sophomore efforts that manages to top the book before it in every way. It's a bigger, bolder story, and one that really does an exceptional job of building upon all the elements of the first. Owl is, as everybody around her likes to remind us, an absolute train wreck. She's neither the smartest nor wisest of young women, her choices are often suspect, and her selective morality is . . . well, just about perfect for a professional antiquities thief. Owl is defined by her contrasts and her contradictions, and what makes her exasperating for some readers is what makes her fascinating for others. Personally, I find her to be a hell of a lot of fun, and if I feel the urge to slap her upside the head once in a while, that's a testament to how invested I've become in her character. It should come as no surprise that Owl is in trouble again, but this time it's not for anything she's done. Instead, there's an impostor out there, another thief raiding forbidden archaeological digs for cursed items. The IAA (who protect archaeological sites from the world, and the world from the supernatural) are after her, the vampires from the first adventure still want her dead, and a group of Somali pirates would very much like her out of the way. She's in well over her head, and things only get worse when she becomes cursed herself. We get even more of the “Indiana Jane” element here, and that's where the book shines the brightest. Owl drags us down into multiple tombs and temples, past traps and treasures, and brings us face-to-face with more than one mummy. The urban aspects are even stronger here this time as well, with some cleverly satirical jabs at celebrity culture that should make even the most jaded reader smile. Much to my surprise, what originally seems like a bit of a throwaway segue between desert adventures comes back to dominate the final act, with . . . well, I don't want to give it away, but let's just say Hollywood has prepared us well to face rampaging hordes. If there's one weak spot to the series for me, however, it's been the World Quest video game angle. I get the value in being able to virtually explore historical sites, and Owl's interactions with Carpe add a little humor to the story, but it gets a bit tiresome. The big tease of the epilogue promises big things ahead for World Quest and its creators . . . I just hope it doesn't mean we get an RPG dominated third chapter. Ultimately, this is one of those books that just doesn't let up. Every new twist just ups the tension, and every new revelation just teases something more. By the end, we understand a lot more about who Owl is and why, but there are some tough choices to be made along the way. The story lags a bit during the penultimate arc, with the resolution of the counterfeit Owl storyline, but the final act was a huge surprise and an even bigger delight. If you get to that point wondering if Charish will really go there, rest assured she does. Glad you enjoyed the second in the series. Always liked Indiana Jones styled stories. As for the RPG - I would rather play it than read it, so hope there's not an overload of that element. Sounds like a lot of fun. I really wanted more of the "archaeology" and "tomb raider" vibes in the last one, so I'm happy to hear we'll get more in City of Angels!